Anastomotic leakage represents a devastating post-surgical event with surgeon- and patient-related causes. The early lag phase of healing (day 0–4) is a time of increased vulnerability. The current role of tissue sealants as anastomotic adjuncts remains unclear, with controversial results reported. Platelet-rich plasma provides a reliable source of growth factors supporting wound healing. 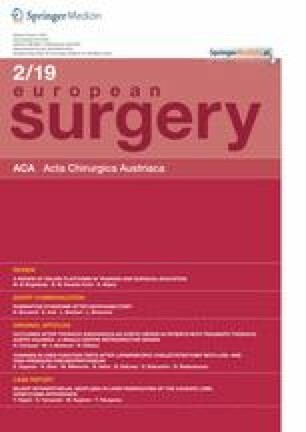 We aimed to assess the impact of a novel autologous platelet-rich fibrin (PRF) agent (Obsidian-ASG® matrix; GergMed Medizintechnik, Baiern, Germany) on colonic anastomotic healing in a porcine model. Left-sided colonic anastomoses were constructed in 16 pigs with reinforcement using the Obsidian-ASG® matrix in 12 animals. Animals were sacrificed on days 0, 4, 10 and 30, with histologic assessment of the anastomotic line along with evaluation of fibrotic tissue maturation, foreign body reactivity and mucin production. Collagen maturity and immunohistochemical changes of angiogenesis and infiltrating macrophage profiles were determined as well. There was no observable effect in matrix-treated animals on epithelial line thickness, granulation tissue formation, foreign body reactivity or mucosal restitution. Matrix-treated animals showed higher mucin production on day 4 accompanied by a more mature collagen and a greater degree of early angiogenic response with a higher infiltration density of M2 macrophages. Additionally, anastomotic burst pressure in matrix-treated animals was higher on day 0, 4, 10 and 30 (100, 100, 210, 160 vs. 40, 30, 60, 20 mm Hg, respectively). Obsidian-ASG® matrix may have beneficial effects on anastomotic healing by shifting the inflammatory response towards a mature and more stable collagen phenotype in the early phase. Bernhard Dauser, Wolf Heitland, Franz Bader, Walter Brunner and Yael Nir contributed equally to conception and design of the study, analysis and interpretation of data, and drafting of the manuscript. Andrew P. Zbar assisted with manuscript draft preparation and critical review of manuscript. The study presented was sponsored by GergMed Medizintechnik, Baiern, Germany. B. Dauser, W. Heitland, F.G. Bader, W. Brunner and A.P. Zbar have no personal financial ties to Vivostat®, Allerød, Denmark or GergMed Medizintechnik, Baiern, Germany, or patent holdings etc. to declare. Y. Nir works as a consultant for GergMed Medizintechnik, Baiern, Germany.